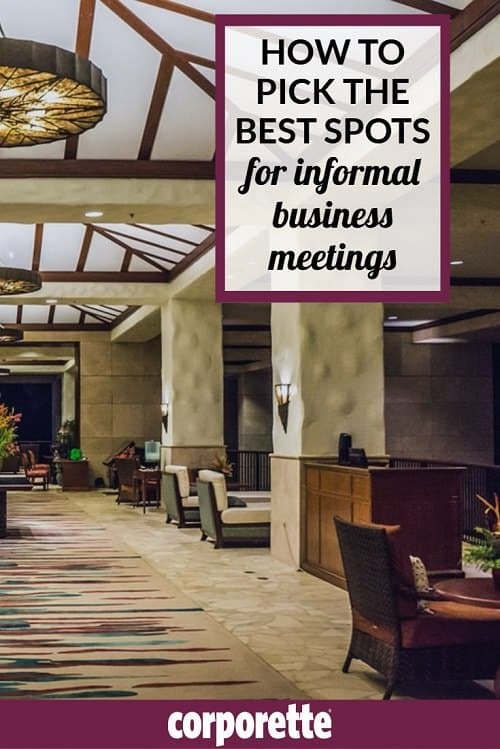 Years ago I had a meeting with a lawyer-turned-entrepreneur, and he made an interesting comment I still find myself thinking about: his preferred place for informal business meetings was hotel lobbies. (Looking back he probably got the idea from this NYT article!) There are obvious advantages to this — they’re nice, public spaces; they usually have food and drink available, as well as bathrooms, free WiFi (or WiFi you may be able to get if, say, you stay one night) — and they also generally don’t mind if you linger or talk. But at the time, I wondered: was that really the best place for informal business meetings for women? Could I steal that trick for myself? 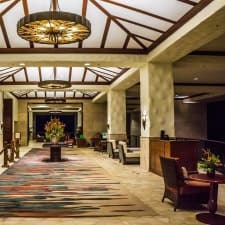 Cut to a week ago, when I had a phone conversation with a consultant I’m mentoring, and we were discussing whether she needed conference space of her own — and my mind came back to the conversation about hotel lobbies. My hesitation here has always been the one a lot of you are probably thinking right now: you don’t want any client to misunderstand you and think you’re propositioning them. We’ve talked before about where to find new clients and general business development tips — how to network in a general way so you can meet new people who eventually become clients — but not where to physically meet up with prospective clients if you want an informal meeting place — so let’s discuss. For those of you who try to woo clients or new hires, or generally like to meet on neutral ground: where are your preferred places to meet up with clients? How do you choose it — by proximity? Familiarity? Cost? Do you prefer coffee shops or restaurants to spots like hotel lobbies? Do you think there are big advantages to meeting on neutral ground — is it easier to get a prospective new client to see you to talk business and gauge fit if they’re “just meeting for coffee” versus the big scary “coming into your office to meet the team” kind of meeting? 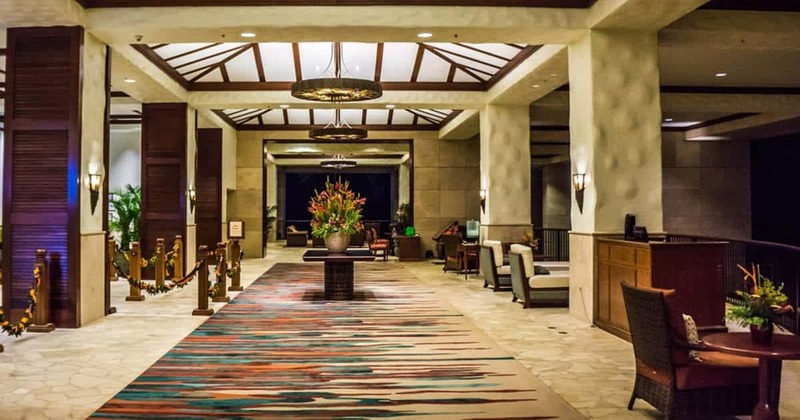 If you often work away from home or your office, do you like to use hotel lobbies? Over to you, readers — what are your thoughts on the best places for informal business meetings for women? Pictured: Pixabay (Ko Olina Marriott Hotel Resort Oahu). Along these lines, has anyone in NYC heard of The Wing? Thoughts? Cost aside, it seems like a great idea to have a home base between meetings and events, and network with other women. Then I wonder if any real networking actually happens or if people just go about their day, quietly use the space, and don’t really interact. I’m not anywhere near NYC, but I like their Instagram. I have a few friends who were part of the initial launch class of members, and they really love it! The Wing hosts speakers/events, which can serve as a good way to meet people–especially across industries, where the content of the talk can be a great launching-off point for a conversation. Hi What a timely topic! I just discovered this blog and I love it already. I have two clients that thare finally paying enough to justify paying for space. So I am renting through a co-working membership that gives me a few hours per month. Before that I was meeting at a local Tea shop (Argo) downtown in the look near the client’s office. I have used my home office before but it;s exhausting keeping it “clean enough” to have impromptu meetings. I live in chicago and not far from downtown so I had lots of options when I was shopping for a co-working arrangement. My former boss was a big proponent of having prospective client meetings at his alumni club in the city. It was a good conversation starter (awesome view) and the staff had his back. There’s a lot of start-up squatting in my industry (using another business’s conference room, instead of paying coworking space charges). I’m not a huge fan but the internet is usually faster. I love hotels, but I would find meeting in the lobby itself kind of weird. I often meet people (socially and for business) at hotel lobby bars/lounges, but just camping out at the chairs next to check-in seems odd to me. I have a few of these meetings each week in NYC and have a stable of coffee shops that have sufficient seating (no Starbucks or trendy coffee bars with standing room only) and decent acoustics. I’ll occasionally rotate ones out if they become too crowded or unreliable. My former boss would sometimes use hotel lobbies but many have strange seating – giant chairs that are ackwardly distant from one another – and in general, cafes have just been more convenient given the huge number of options in NY. I’m not a member of a private academic club but will occasionally meet people who are there. The local public library. Many have study rooms that can be used free or very low cost (e.g., $2 per hour for businesses). Ours has a cafe. Free wifi, bathrooms, not competing with families gathering in the hotel lobby, etc., make them a great neutral territory. Can’t connect to the Internet the library staff is going to be more accommodating than a hotel to non-guests. I’m outside NYC but my apartment has a business office AND a clubroom with free coffee, so it’s easy access. Agreed. Local indie coffee shops at “off hours” like 10 am or 3 pm often do the trick for me. I also have a wine bar that I’m partial to. It’s not my favorite wine bar, but around 5 pm, it’s not crowded and the set up has lots of seating space designed for small conversations. I met a potential client at a wine bar. It started out very professional, but after 3 glasses of pinot noir, the potential client grabbed my thigh. I told him that I was not interested in that, so he took his hand away. But since he clearly was tipsy, I told him we could reschedule, and we did, at the town hall meeting room. That was 3 years ago, and his firm has now become a large client of ours. He has not made another stupid move on me since, and that is a reason you should always give people the benefit of the doubt. Caffeine – any chance you’d share a few favorite locations near Bryant Park and/or Grand Central? I have to schedule a few job- related meetings there in the next couple of weeks. Thanks! Try Fika on 41st St. near Bryant Park. They always seem to have a lot of tables. I also really like the LPQ over there, but if it’s lunchtime it can get kind of loud. I think meeting in hotel lobbies is sort of a old-fashioned thing. My mom, growing up in Boston in the 30s and 40s, would use hotel lobbies as meet-up places when getting together with a group of friends, or if she just had to wait an hour or two–for a friend, for a train home, etc. In the 80s and 90s, friends who were in sales would use the downtown Boston hotel lobbies as an informal office between sales calls. Again, they could use the phone, have a safe place to sit, a bathroom, and do a little paperwork. But a lot of newer hotels have much smaller lobbies, and fewer services available. Most don’t have coffee shops, for example. And because they are a lot smaller, it’s more difficult to find a private corner to hold a meeting. But if you Google images of, say, the Ritz Carlton in Boston, New York or Chicago, you’ll see that the lobbies are spacious, set up with small seating groups, and some even have desks. * Some Westins (maybe other SPG properties, too?) offer hourly rental of small conference rooms, called “Tangent” rooms. For example, the Westin Peachtree Plaza in Atlanta charges something like $50/hr for a conference room stocked with all the A/V, office supplies, and snacks you could want: http://www.starwoodhotels.com/westin/property/meetings/fas_detail.html?propertyID=1023&fasXRefId=1023236750.